Guest Opinion: What’s the Big Deal About Content Protection? First it was DeCSS, the open-source Linux computer code that defeats the security software on DVD-formatted movies. Now, an MIT student and an alumni friend have developed the shortest program to break DVD copy protection to date. While the seven-line program does unscramble the protection around a DVD, the developers have emphasized that no one would use the program for routinely watching movies. The reason is that the unscrambling requires so much processing power. Even on the most powerful processors, movies appear choppy. On the Internet, the greatest deterrents to piracy are computer memory and modem bandwidth. The average DVD movie used nearly 5 GB of capacity. Even if you had the storage capacity, it would take 22 hours to download with a 56k modem, and you wouldn’t be able to download separate track extras, such as director commentary and behind the scenes documentaries. The challenge today is that we live in a digital environment. Increasingly, all of our data, documents, images and sounds are becoming digital. 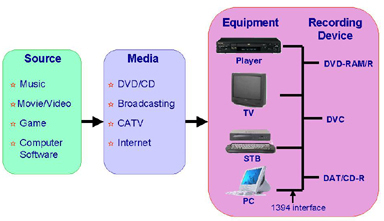 This information is distributed using various media, including DVD/CD discs, the Internet and by broadcasting stations. It is received by home and office computers, TVs/radios, players and other devices which use a variety of storage mediaóDVD-RAM/R, DVD-R/CD-RW, DVC, tape and so forth. Because of this, copying digital contentólegally or illegallyócan be easier, more economical and faster than it was with analog content. Just as people make illegal photocopies of materials without thinking, some of the illegal digital copies are also done innocently. However, for those who wish to benefit from other people’s work, digital copying represents a huge profit. The CPTWG was formed following agreement by international members of the government, IT industry, consumer electronics industry, video and audio content developers, cable and content distributors and conditional access providers. Their mutual objective was to create a secure copy protection system for the DVD family, as well as other applications. There will always be those who want to make a dishonest profit, but international copyright laws were designed to protect and promote innovation and creativity. The DVD Forum’s logic was that it is better to protect people from themselves rather than sniffing out and suing for each illegal use. Today, there are hundreds of thousands of Web sites for pirated software, music, films and games. Contrary to popular belief, being on the Web does not make a product free. Many people view software theft as a «victimless» crime. But globally, it costs the software industry an estimated $12 billion annually in lost revenue. In Russia, Bulgaria and Turkey, illegal software sales (excluding OS) are about 70 percent of the total sales. And in China and Vietnam, its more than 90 percent. According to Autodesk management, every legal sale produces eight illegal copies. Those people can afford it? Previous: State of the Art: Is Streaming Dead?